[ACT](VC) Limit Break 4(This ability is active if you have four or more damage):[Counter Blast (2)] Soul Charge (2), and this unit gets [Power]+1000 for each «Dark Irregulars» in your soul until the end of your turn. 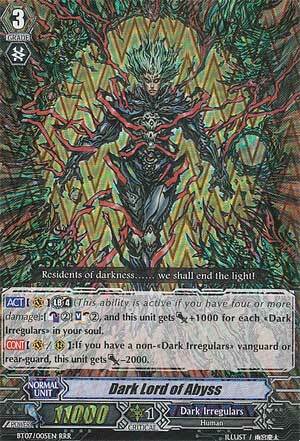 [CONT](VC/RC):If you have a non-«Dark Irregulars» vanguard or rear-guard, this unit gets [Power]-2000. [ACT](VC) Limit Break 4(This ability is active if you have four or more damage):[Counter Blast (2)] Soul Charge (2), and this unit gets [Power]+1000 for each «Dark Irregulars» in your soul until the end of your turn. ...hold up...what happened to all of the animals?! I was enjoying the animals personally...where the heck this guy come from??? Anyway, Dark Lord of Abyss is a nice and solid card as its at a base 11,000 and can Soulcharge himself. The downside? That's it's Limit Break, and having to Cointerblast 2 to Soulcharge 2 seems a bit much as most of Dark Irregulars Soulcharge for free practically even with the Amon clone. Also, there are better options than Dark Lord.